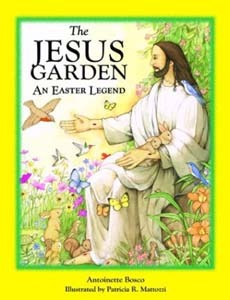 "The Jesus Garden, An Easter Legend," published by Pauline Books and Media is my first children's book, and it happened by surprise. I've written two books for teenagers, 10 books for adults; a weekly syndicated column for Catholic News Service since 1974; and hundreds of newspaper stories and magazine features in my writing years. The origins of The Jesus Garden have to do with the most important vocation I have had--my motherhood. Ever since I was quite young, I was drawn to stories of how connected Jesus was to nature. I heard the fables of why the robin's breast is red--because this beloved bird tried to pull the thorns from the head of the crucified Jesus, becoming blood-stained--and why the flowers on the dogwood tree are cross-shaped--because this was the tree used to make the Cross. When I was raising my children, I told them these stories and made up other ones, that I felt could also be fables true to creation. The Jesus Garden in book form came about by "coincidence"--or perhaps, more truly, by God's design. I had met Sister Madonna, the acquisitions editor at Pauline Books and Media, a few years ago, feeling immediately that I had found a "soul sister." In one of our communications, I sent her a copy of my stories because I thought she might enjoy reading them. Well, she not only did, but she passed them on to the Sisters who select children's books for publication. I was simply overjoyed when they contacted me, telling me Pauline Books and Media would like to publish my stories, with full color art work. Now I shall be passing on my stories to many children--and my grandchildren--in a book that is truly beautiful. I believe there is definitely a relationship between the "truth" of a fable or legend and the truth of the Christian faith. In the Gospels, we hear Jesus speak over and over in parables, stories, many of them in the genre of fables. He used these to help convey his important messages because he knew that people respond to stories on a human and heart level, and so can learn in a way that moves them. Sermons are important tools for teaching, but stories create the magic of remembering. I think this book can take a child from seeing that there is pain and cruelty in this world, to the much better place of finding the great surprise of joy. Children, who feel a true connection between the creatures of nature and themselves, will relate to those in the Jesus garden who showed love when the world spawned hate, and will, I believe, choose to be loving like them. The Daughters of St. Paul predict that this book "is sure to become a seasonal favorite." I hope you, my readers, will agree! Excellence in Media is a California-based organization dedicated to the promotion of quality family oriented programming in all facets of communication. "Our aim," says Mary Dorr, President of Excellence in Media and founder of the Angel Awards, "is to encourage the media to turn out more real, positive and even objective messages that inspire and raise peoples awareness a few levels." She adds, "Our media is our showcase mirror. Excellence in Media stands for non-toxic entertainment—media for all ages, the kind that raises our spirits and contributes to the meaningful and enlightening examination of our lives."